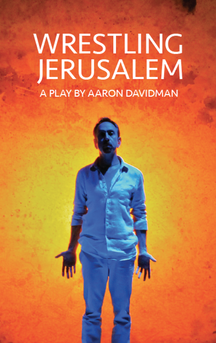 WRESTLING JERUSALEM - Stage Trailer from Aaron Davidman on Vimeo. Set in ﻿America, Israel and Palestine, WRESTLING JERUSALEM follow﻿s one man’s journey to understand the Israeli-Palestinian conflict. Davidman’s solo performance is a personal story that grapples with the complexities of identity, history and social justice. Giving voice to seventeen different characters--moving between male and female, Jewish and Muslim, Israeli and Arab--the play sheds light on one of the most entrenched conflicts of our time. Davidson Bidwell-Waite; Marcus Gardley; Adam Cummings; Joseph Haj. This project has received support from TJT, Theatre J, Sundance Institute Theatre Program, Walter and Elise Haas Fund, Jewish Community Federation & Endowment Fund and the Zellerbach Family Foundation.